Bill died in his sleep on May 17, 2016, at 2:16 am, following a 10 year battle with Polymyocitis, a chronic muscle disease that attacked the organs of the body. Bill had been having a rough year — a broken foot in May, 2015, started the problems, then he sprained has back, got a swollen leg due to vein problems, and had a large callus on his right foot. He’d spent a lot of time at home unable to maintain his muscle strength. He’d gone out for occasional walks, but they had been limited to the local neighborhood. He also had problems swallowing due to the weakening muscles in his throat. He lost 25 pounds. He also had to spend several days in the hospital to get antibiotics via IV for his swollen leg three times in four months, January through April, 2016. On Monday afternoon, April 25, the worst thing possible happened to him. He lost his balance getting out of the car going to a doctor’s appointment and fell, hitting his head and back on the concrete floor of the parking garage. 911 was called and he was taken by ambulance to the ER at California Pacific Medical Center, Pacific campus. Four hours later in the ER he had two seizures, 15 minutes apart. He was unable to speak coherently after that and didn’t remember much except for his name and Larry's. He did seem aware of his surroundings, he recognized Larry and gave him a lot of big smiles, but when he tried to talk his speech was so slurred no one could understand him. They did a CTScan, a lumbar procedure, also known as a spinal tap, and an MRI and they didn’t find anything wrong. That was good news! He was monitored constantly and seemed to be in good condition except for the memory and speech problems. They say this is typical of someone who has had a seizure. On Friday, four days after his fall at around 10 pm, Bill "woke up" and started chatting with the nurses. 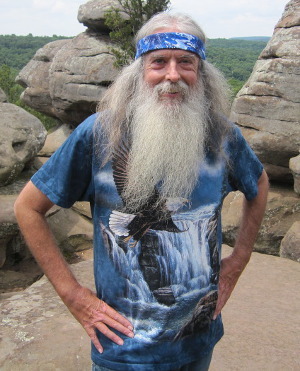 When Larry walked into Bill's room the next afternoon he was greeted by "There he is... my hubby is here!" Larry was so surprised and happy, and Bill was happy too. He didn't realize that Larry had been visiting every day, and he said he remembered nothing from the past five days. Larry filled him in on all the details of the past week. Bill asked Larry all kinds of questions. Bill was having difficulty swallowing due to weakness in his throat muscles, so the doctors didn't want to take any chances of him chocking so they inserted a feeding tube to give him nourishment. He also was having a little difficulty breathing so they were feeding him oxygen. They increased his muscle disease medicine, prednisone, thinking that Myositis was causing the poor response from his throat muscles. Later they went from an oxygen tube to him wearing an oxygen mask that forced the air into his lungs to help with his breathing. He just wanted to sleep a lot. 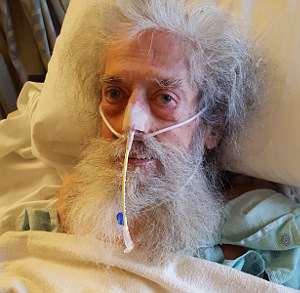 Over the next couple of days Bill's breathing started getting weaker and weaker so they moved him to ICU and installed a breathing tube that would provide all the oxygen he needed without him having to work so hard for it. Again, they felt that this problem was due to the effects of his Myositis disease. Bill's condition remained about the same with the breathing tube and feeding tube handling oxygen and food going into his system. He was awake and alert. 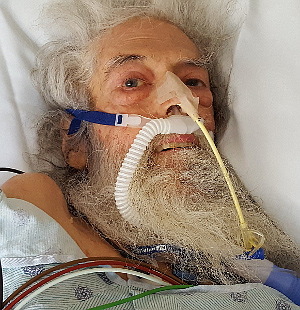 He couldn’t talk with the breathing tube in his mouth, but he was responding with nods or head shakes side to side or by writing notes on paper. He looked at the cards Larry brought in and they talked about the comments and calls Larry received from family and friends. After a few days Bill's muscle strength in his lungs and throat started to improve from the stronger dose of prednisone, and his doctor was very pleased with that. Then his blood platelets dropped below a safe level and they needed to give him an infusion of blood platelets. His muscle building then leveled off but they thought that was a temporary thing due to the platelet problem. Then on Saturday, May 14, the doctor reported that Bill's kidneys were starting to fail so they needed to put him on dialysis. Bill said no to the dialysis. He told the doctors that he couldn't tolerate all of this anymore and he wanted to get off the breathing tube and feeding tube and not have any more procedures done. He didn't foresee any good days ahead. He just wanted to live the best he could without all the support mechanisms and wanted to get out of there and go home. After all the efforts that had been made and he continued to have problems cropping up, he felt that his life would never be good again and it wasn't worth continuing the fight. They started easing him off the breathing machine and removed the breathing tube about 6 pm Saturday. Bill was back to breathing on his own. The doctor asked him how he was doing and he responded "Good, and I can talk again." On Sunday his breathing continued to be okay and his vital signs were good. Larry and Bill talked quite a bit and he said he wanted to survive as long as he could, but on his own without medical support. He agreed that he had to let them work on getting his throat working again so he could eat and not have to use the feeding tube. On Monday, May 16, Bill was sound asleep when Larry arrived in his room. His doctor said that his kidney was failing fast and she expected him to slowly go into periods of more sleep and less periods of being awake. Without the dialysis he probably had few days left to live. As the toxins built up he'd want to sleep more and more and would finally die comfortably in his sleep. She said that feeding him now would only make the problem worse, so they removed the feeding tube. The Myositis had hit him really hard. They understood that Bill wanted to die at home, so arrangements were made to deliver a hospital bed, oxygen and medical needs for Bill to his home on Tuesday morning and Bill would be brought home by ambulance about 1:30 pm. A hospice nurse would make visits and he would have 24 care from care givers. When Bill awoke briefly, Larry told him that he was going home and he smiled and went back to sleep. That's the last contact Larry had with him. He continued to sleep. Bill died peacefully in his sleep at 2:16 am on Tuesday morning. He didn’t make it home. At the time of his death Bill was 69 years of age.